Hewlett-Packard's NonStop servers tolerate faults even though new CEO Meg Whitman and Wall Street, which is breathing down her neck, can't. And now, in a hope to offset declines on its HP-UX Itanium server business and get its NonStop Integrity machines into emerging markets, HP has trimmed down the configurations and prices on the NonStops so they are within economic reach of more customers. Unlike the HP Integrity and Superdome servers that run HP-UX and the OpenVMS variants of the Integrity machines, the NonStop platform that started out as Tandem and came to HP through its acquisition of Compaq more than a decade ago is one that HP absolutely controls and that Oracle can't really do much to. As is the case on AIX and Solaris, Oracle's 10g and 11g databases are by far the preferred databases on HP-UX and a fair amount of HP-UX business is driven by Oracle's myriad application suites. Oracle also controls the RDB relational database for OpenVMS, too. And clustering technology from Tru64 Unix is the underpinning of Oracle's Real Application Clusters thanks to a licensing deal with Compaq that predates the HP takeover of Compaq. The NonStop machines use fast networking and clustering technology to make a parallel database look like a single database to applications; the software has fault tolerance, which means if you lose a server node in the network, processing continues on the remaining nodes without crashing the application. With the NonStop line, financial services, payment processing, stock exchanges, healthcare, and telecom firms (who are often legally mandated to keep their systems up and running) generally write their own applications and are well acquainted with the NonStop Kernel operating system and the NonStop SQL database and these days are apt to be coding apps in Java, often from within Microsoft's Visual Studio app dev tool. Larry Ellison can compete with NonStop with Oracle RAC on Solaris or Linux, but he has no app or database or middleware levers to play here as he does with HP-UX and to a much smaller extent with OpenVMS. It is a wonder that HP hasn't figured out that the one operating system and database it needs to port to Xeons isn't HP-UX, but rather NonStop. Then HP could use cheaper Xeon iron and integrate the ServerNet network clustering into the machine. I'll go one further and say that maybe HP needs to buy Cray specifically for this Linux layer and build an entirely new server business from Cray and Tandem. This ported NonStop environment would, for instance, go very nicely with the future "Project Odyssey" Xeon-based servers that the company is working on. The NonStop 2100 is based on the rx2800 i2 rack-mounted server, which debuted back in April 2010 with the rest of the Integrity and Superdome servers sporting Intel's "Tukwila" quad-core Itanium 9300 processors. 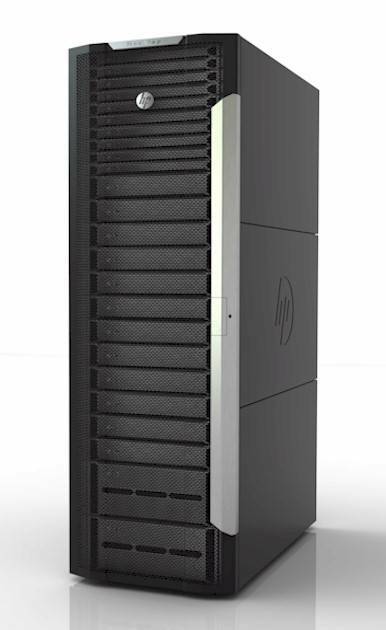 This is a two-socket server, just like the blade servers that other Integrity machines are, but HP only puts one processor in the system and, depending on the model, only activates one, two, or four cores in that single socket. This may sound strange, but it means HP only has to buy one chip from Intel to make a diverse line of machines – in the case of the entry NonStop machines, that would be the 1.33GHz Itanium 9320 processor, which has 16MB of L3 cache and costs half as much as the top-bin 1.73GHz part. By the way, according to Randy Meyer, director of product management for the NonStop line within HP's Business Critical Systems division, you can't activate those latent cores in an NS2100 or NS2200 node. So don't bother trying. (You need at least two nodes to be fault tolerant.) Rather than using the high-end ServerNet clustering that is at the heart of the larger NonStop machines, HP has cooked up a variant cluster technology called Expand-over-IP that allows regular Gigabit Ethernet links and outboard switches for linking I/O, storage, and telecom switching systems. The NonStop machines create a logical processor, which can have from two to four cores and therefore from two to four nodes. These logical processors can have from 8GB to 32GB of logical memory, and they are then linked with the Expand-over-IP network stack into a larger cluster over the Gigabit Ethernet backbone implemented by the IP Cluster I/O module, or I/O CLIM for short. Up to 1,020 logical processors can be linked together into a single fault tolerant cluster with a maximum of 32TB of memory and up to 4,080 Itanium cores across that cluster. There are Storage CLIMs to link to storage – in this case, arrays with up to 200 disk drives – and if you are in the telco racket, the Telco CLIM to link into switching systems. The NS2100 can have up to six of these CLIMs in its networks. At the moment, the NS2100 ships in a 42U rack, but Meyer says a more compact 36U system is coming within a few months. You might be thinking, how can a NonStop cluster run over Gigabit Ethernet? Well, the kinds of applications that customers tend to run on NonStop machines typically have lots of tiny transactions. "It's not like you are moving around pictures of your dog," says Meyer with a chuckle. With the NonStop NS2200 entry system that debuted in February, all the feeds and speeds are the same except that each rx2800 i2 server has two of its four cores activated, and therefore you can bring roughly twice the computing capacity to bear across those 1,020 logical processors and 32TB of main memory. With the NonStop BladeSystem NB54000c machines that were announced in March 2011, the nodes are clustered together with proper ServerNet switches and use the IP, Storage, and Telco CLIMs to talk to the outside world. The NB54000c has a logical node comprised of two blade servers and it can expand up to 16 blade servers. Each blade is actually a two-socket on the Integrity BL860c i2 blade server, and again there is only one physical processor installed on the blade. Customers can have two or four cores on the Itanium 9340 activated; they spin at 1.6GHz. The high-end bladed NonStop uses the same c7000 chassis as ProLiant and Integrity blade servers, and it can scale up to 255 logical processors to a total of 4,080 physical blades with up to 16,320 Itanium cores in a single cluster. The bigger box can support 48 CLIMs and 2,400 SAS disks or 60 I/O Modular Enclosure adapters (from the old-style NonStops) with 3,248 Fibre Channel disks for storage. A base configuration of the NS2100 system comes with two logical processors in two nodes, 8GB of memory in each node, six system disks (with three mirrored volumes) and six data disks (again in three mirrored volumes. The machine comes with the NonStop Kernel operating system, but not the NonStop SQL database (not all customers use the database, according to Meyer) and costs $75,000 with a one-year license to NonStop Kernel. If you want to add NonStop SQL, an annual license will run you around $13,000, depending on features. That NS2100 also costs a lot less than an NB54000c setup, and this is what is important for small and midrange customers as well as companies and government organizations in emerging markets that don't need the full processing and I/O capability of the NonStop BladeSystem but who want fault tolerance just the same. Depending on hardware and software configuration, an entry NB54000c machine can cost as much as $500,000 according to Meyer, with a typical base configuration running around $325,000 for two logical processors. Pricing for the NS2200 starts at under $150,000 for a base machine with a one-year license for NonStop Kernel. HP does not break out sales of the NonStop products from other systems in the Business Critical Systems unit, and therefore Meyer cannot get specific about how this line is doing. "We are growing customers, growing market share, and growing our ISV partner base – and we're not losing customers," Meyer tells El Reg>, adding that the cost of clustering up Linux systems for high availability is no cheaper than these new NS2100 machines and that is why HP has been able to grow the NonStop installed base. "Customers love their NonStop machines and they run them forever and ever." HP is not yet ready to talk about its plans for the impending eight-core "Poulson" Itanium 9500 processors from Intel, which will scale from 1.73GHz to 2.53GHz. If HP goes with the eight-core Itanium 9550 part running at 2.4GHz, it could drop these into the NS2100 and NS2200 machines and boost performance by around 50 per cent – even after turning off seven of the eight cores, as crazy as that sounds. Now can you remove it from every Start Menu?